I understand you wish to restore the caliphate in Iraq and Syria. But are you sure this is really what you want? As a secular, liberal Arab living in the 21st century, I’m not keen on turning back the clock in this way, but I think I’m better prepared for it than you. Judging by your brutal and bloodthirsty behaviour and the twisted rulebook you’ve released, I have this sneaking suspicion that you have no idea what bringing back the caliphate actually means or involves. Let me give you a clue, it would entail thriving in diversity, penning odes to wine, investing in science, patronizing the arts… not to mention appointing a gay court poet. If I mentioned any other Paradise, I’d be worse than a dog. ISIS has banned alcohol, as well as drugs and cigarettes, in the domain under its control. But what these fanatics seem to misunderstand is that alcohol may be prohibited religiously (haram) in Islam, but there was plenty of full-bodied Caliphornian wine around, as the above verse by Omar al-Khayyam illustrates, which follows in the tradition of khamariyat, or wine poetry. “Commanders of the faithful” they may have been but Caliphs were known to indulge in the unholy grape. These included the Umayyads and the Abbasids. Even Harun al-Rashid, who is regarded as the most “rightly guided” of the later caliphs, is reputed to have drunk. And even if al-Rashid himself did not partake, his court did, as mythologised in many stories of the 1,001 Arabian Nights, especially his gay court poet Abu Nuwas, who definitely preferred wine to girls. Instead drink to the rose from a rosy red wine. Leaves its redness in both the eye and the cheek. Camp, outrageous, irreverent and witty, Abu Nuwas was considered the greatest poet of his time and is still up there among the greats, despite the more puritanical age we live in, where his odes to male love would make a modern Muslim blush. a mine of luxury – dig me. During to the apparent jealousy of his mentor in Harun al-Rashid’s court, Ziryab, the Sultan of Style, fled to the rival Umayyad court in Cordoba, where, among other things, he taught Europeans how to become fashion slaves. Diversity and multiculturalism were the hallmark of Islam’s most successful caliphates and caliphs. In fact, the lightning speed with which the Arabs were able to conquer a vast empire was partly faciliated by the greater freedom and lower taxes they offered local populations compared to the bickering former imperial masters. This was coupled with an early form of welfare state established by the second caliph, the austere Umar Ibn al-Khattab who lived in a simple mud hut to be close to the poor and believed in social and economic equality. 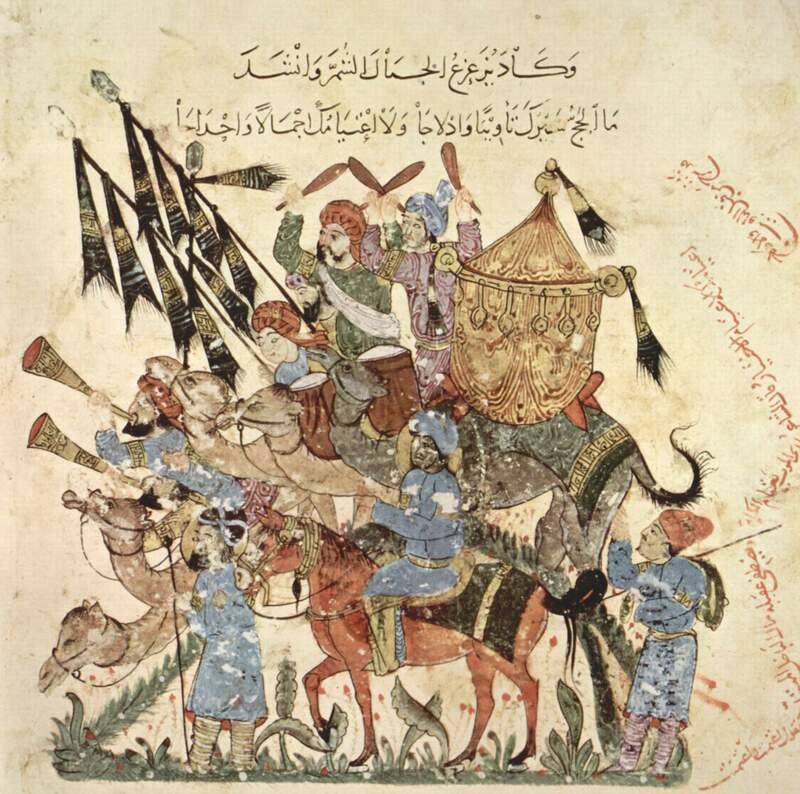 Under the Umayyads, whether centred in Damascus or Cordoba, and the early Abbasids, Islam’s “golden age” was characterised, rather like today’s America, by a complex synthesis and symbiosis between the cultures which fell under Islamic control as well as neighbouring civilisations. It incorporated Christian, Jewish, ancient Greek, Byzantine, Persian and even Chinese ideas and added to them to create a new, dynamic whole. The Ottomans were also at their most successful when they tolerated and promoted diversity. This is a far cry from the uniform puritanism ISIS seeks to impose on its self-described caliphate. The ISIS advance has resulted in the mass flight of Christians from northern Iraq. And the Chaldean Catholic Archbishop of Mosul fears they will never return, while the ancient Assyrian community of Bartella wait in terror. This fear is hardly surprising given the treatment ISIS has meted out on fellow Muslims, such as the mass executions of Shi’a soldiers, not to mention the oppressive rules ISIS has outlined for Muslims in its conquered territory. This is very different from the ideals of religious tolerance which Islam’s various caliphates often aspired to, with probably the Umayyads and Ottomans in their heydays winning top prize in this category, and qualifying as the most enlightened of their age. Even the traditional notion that non-Muslims are dhimmis (protected minorities) who are free to practise their faith but are inferior to Muslims contradicts the principles of equality embedded in Islam. This is amply illustrated in the Constitution of Medina drafted by Muhammad himself which stipulates that Muslims, Jews, Christians and pagans all have the same political and cultural rights. So it would seem that Islam, as practised by its prophet, gave Muslims an advantage in the hereafter, not the here and now. Moreover, the Quranic injunction on “no compulsion in religion” also means that ISIS has no right to force Muslims to pray, whether in the mosque or otherwise. ISIS and other violent jihadists not only conduct “holy war” incorrectly, inhumanely and for the wrong reasons, they also ignore the “greater jihad”, the struggle to build a better self and society. In addition, their fixation on implementing “sharia” is baffling. This is partly because their interpretation of it is at odds with traditional scholarship. Moreover, sharia has differed significantly over time and place. More fundamentally, the bulk of what is regarded as Islamic law today was reached through the reasoning of early Islamic scholars. Since we live in radically different times, it is high time to reopen the gates of ijtihad – which were sealed by the Abbasids in a bid to cement their authority – and to rethink and reinvent the Islamic legal system. In its heyday, the Abbasid Caliphate’s capital Baghdad – which ISIS are perilously close to conquering – was a centre of science, culture, philosophy and invention. This was epitomised by the Bayt al-Hekma, which was a world-leading institute of learning until the Mongols sacked Baghdad in 1258, devastating Abbasid society to a similar degree as the US invasion of Iraq in 2003. ISIS has informed women that their place is in the home and that outdoors they must wear “full, wide Islamic dress”. Well, they should start with themselves and wear the hijab too, since, if it is an obligation at all, it is one that applies to men too. Although Islam is a typical patriarchal society, women’s place has never been solely in the home, except in a minority of cultures. It might shock ISIS to learn that the idea of cloistering women out of the public eye may not have been an Islamic idea at all but one borrowed from the Byzantines. Women played a key role in the spread of Islam by the word, such as Khadija and Aisha, and by the sword, such as Hind bint Utbah and Asma’a bint Abi Bakr – sort of Kill Bill characters of the medieval world – who were instrumental in the defeat of the Byzantine forces in one of the most decisive battles in history. In addition, women made important contributions to science, philosophy and society throughout Islamic history – a role that has been under-researched but is eliciting more interest today. They even ran empires, albeit discretely. Most importantly, Islam’s attitudes to women have varied according to local culture. Iraqi and especially Syrian women have been on a long road towards emancipation, and even the faithful among them see no contradiction between their religion and gender equality. Muhammad never nominated a successor (caliph) nor spelt out a method for identifying one, hence Islam does not prescribe, nor does it need a caliphate. In addition, the caliphate often led to instability due to the absence of clear rules for the transfer of power, and contributed to the absolutists attitudes the region’s leaders traditionally have to power. I like this. I have always been a lover of the Rubaiyat of Omar Khayyam and consider him one of the greatest philosophers that ever existed. There were many great poets and intellectuals in the early days. Very sad that their thoughts and concepts got lost in the turmoil. It seems that all of the religions became lost as time went on and now we have so many that do not recognize reason and sanity.